Anyana eager to offer top quality and 100% safe silicone fondant molds for cake decorators, Non stick easy to use, can be reused over and over. Non stick easy to use, can be reused over and over. we refuses any fillers all the time. You know when we get our customers that truly appreciate our effort and make us feel like our time and work was worth every second. This is Anyana ! Especially in this period, many cheap and ugly made silicone molds are spreading online. We have stronger responsibility to let more and more buyers start to enjoy with Anyana molds ! we make Anyana molds thick, so they hold up better for repeated use, and also for hot items like chocolate and isomalt. If you are using this for food, use it ONLY for food. You can also use for Resin, Clay, Soap, Wax, Fondant, gum paste, candy, chocolate, candy melts, ice, gelatin, isomalt, flower paste, modeling paste, sugar paste. Can be used in the oven UP TO 300 Degrees Fahrenheit. Hand wash with soap and water and allow to fully dry before use. Do not eat. The molds are very flexible, no need to use a releasing agent, just bend, and your creation will come out.Do NOT use sharp tools with the molds. 1.Clean it up with hot water for the first time. Do not use with abrasive cleaner or foam. 2.Don't bake the empty cups. You have to inject water into the empty cups before baking. 3. Must to spray oil before baking. 4. Silicon cups only can be used for the oven and microwave, it never can be directly used in the gas or electricity, or directly above or below the barbecue apparatus used in heating set. 5. Don't stress heavily, pull violently. 6. You'd better put it in carton, placed in the shade when you needn't it. 7.Don't rinse with cold water immediately when taking it out of the oven in order to prolong the service life. 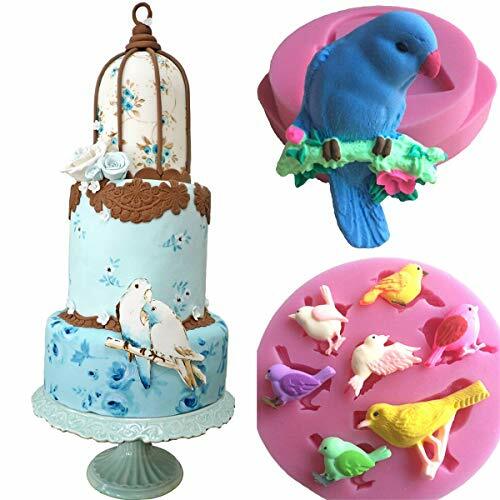 √ This set of birds cake candy molds silicone will help bring your cake or cupcake decorating skills to a new level, enabling you to bring a professional quality to your work. Ideal for use with a wide range of edible and non edible materials, including sugarpaste, petal paste or marzipan, latex, pie decorationg, embellishment and scrapbooking. This is an amazing silicone fondant molds for cake decorations ! It's not cheaply made and the details on the fondant are fantastic ! √ FDA Approved food grade silicone, Easy to clean and store, Dishwasher safe, Oven, freezer, microwave safe too! Can withstand high temp. and freezing, No white fillers when pinched or twisted. No chemical coatings. Made from 100% food grade silicone; stronger, more flexible and durable to maintain its original shape and non-stick quality through more uses.